but you can get them under control. Even though technology like video conferencing and GoToMeeting is reducing the need for business travel, T&E expenditures are on the rise. More than ever, expense management automation is critical for organizations looking to improve operational efficiency, rein in costs and improve employee satisfaction. But where is T&E automation headed? Who's leading the way? Which features would result in resounding benefits for your company? To receive your copy of this report and learn how these trends can provide a positive benefit on your company, please complete the form on the right. And when you’re ready to put the best global, modern, and mobile expense report technology into the hands of your business travelers, we hope you’ll look no further than Chrome River. There's only one thing to say after you've seen our solution - Take me to The River! Chrome River Technologies, Inc. lets business flow for some of the world’s largest and most-respected global organizations. Our powerful, yet easy-to-use SaaS expense management and invoice automation solutions deliver the most modern global and mobile experience in the marketplace. Our highly-configurable business rules engine supports your evolving compliance and reporting requirements in today's ever-changing business climate. Chrome River is rated as a Leader in expense management by analyst firm IDC, and is loved by CFO, CIOs, AP teams, travel managers and business travelers alike. 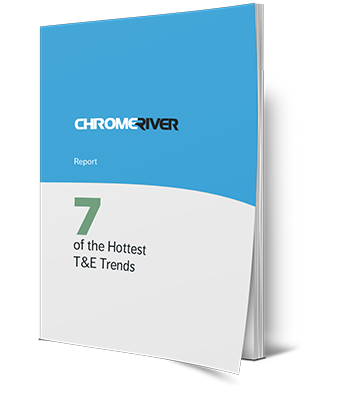 To find out why Chrome River is trusted by more than 2 million users at more than 750 organizations worldwide, contact us at +1 888 781 0088, or visit us at www.chromeriver.com, or on Facebook, Twitter and LinkedIn. © 2009-2018 Chrome River Technologies, Inc. All rights reserved.